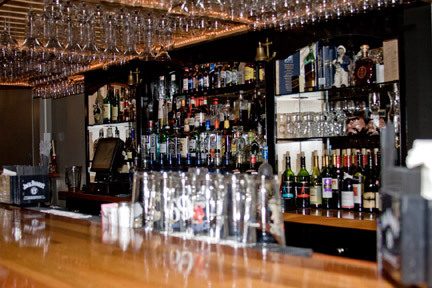 The inviting Portside Lounge offers our traditional menu and spectacular spirits. Our professional Bartenders will serve you with a warm smile and a cold beverage while you wait. The casual atmosphere may keep you in the lounge among familiar friends to dine as well….sit back, relax and enjoy…..
A full assortment of draft and bottled beer is always on hand. From Pale lagers to stout ales, local micro breweries to America’s largest breweries we have what it takes to quench any thirst. A small sample: Shipyard, Fishermans Ale, Sam Adams, Blue Moon, Bar Harbor, Bud, Murphy’s Irish Stout and St Pauli just to name a few. Try any one of our delectable original cocktails! The Village Inn’s very own Ocean’s Potions, Mick’s Martini’s, Captain Don’s Cosmos, Glacial Sensations and a wide variety of Margaritas are made just for you. Drinks like The Dirty Pirate, Mango Clipper, The Village Clipper, Plank Walk, and The Shipwreck are just a small sampling of our tropical favorites.